I really enjoyed this article, and I have to say the those that dont deal with Hemophilia have no idea what we all go through, the outsiders are always to quick to ASSUME and so love to play devils advocate. 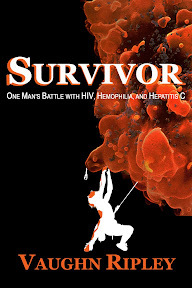 I have severe factor 9 & HCV(genotype 1 severe) I am the hemo that everyone loves to hate(LOL) because I refused to follow the “hemo” rules example; 3 time golden gloves champion competed for years in underground MMA(worse than UFC) played football, hockey, baseball in high school. I always love to tell people for them to come walk in my shoes when I tell them that they always back off(LOL). I very dear friend of mine asked me before he passed to give our fellow blood brothers a message Get Busy Livin’ or Get Busy Dying’. I am also friends with a group of Hemo’s that are studio musicians and have worked with bands such as Metallica,Godsmack, Disturbed and host of others, 4 of 5 of them are 6’9 there drummer is 6’11 they have boys that are also hemos are musicians and are married to carriers. Thanks for the kind words. Wow! Sounds like you take hemophilia to the extreme! Like I allude to in this article, I believe some of our dangerous tendencies come from growing up so sheltered. So cool to hear from another easy bleeder who does NOT take it easy when it comes to life. Carry on, blood brother! I have a 5 year old with Severe Hemophilia B and reading your words are helping me cope. Great to hear from you. And, thanks for the kind words. I wish I could say it gets easier, but it simply does not. That said, you will get better at coping and that is a quite a relief. Good luck! And, please stay in touch. Vaughn, I believe the adversity you faced is what turned you into the outstanding man you are, today. So, although you refer to yourself as being “the lucky one,” in reality, we, all your friends and family, are really the lucky ones, for having you in our lives! See you in Chinatown next week! Thanks, Dan. So nice (as usual) to hear from you and get your support. Thanks, Craig! And, keep living! Thank you for this article. As a mom to a young hemo, it is really hard to not just want to wrap him up in bubble wrap. At almost 8 years old, his passion is baseball and he plays with an older team. I make him do a few extra things for safety, but I encourage him to go play and have fun. It was his first time to actually have to get factor for an injury. Thank you for the kind words! Awesome to hear you are raising your son this way. Awesome to read reports like this! Stay safe, and keep the adventure in his life! I was so happy to come across this article!. There are so many similarities from this story that mirror my own life and struggle almost identically. Thank you for sharing! Great to hear from you, Aaron. And, even cooler to hear about our similarities! I think that much of the hemophilia community is with us. Factor 8, 63 yr old Fluctuating factor from mild to danger in zero. One of the few. Over protective mother syndrome is an occurring reference that I have heard from many Hemos. Thank the creator for them. One of the few things that have helped me to cope with this awful illness is medical marijuana. Since I have been taking this in oil form for the last seven years my bleeding episodes and pain due to ostio have decreased dramatically and I mean dramatically. For those who suffer, please investigate. Until this point I had never used it.It has also cured cancers in three of my best friends. I found the reference to this from some Russian hematologist. and “run from the cure” youtube. Be safe be well and today is a good day. Very nice to hear from you, Kendi. Thank you for reading and sharing your kind thoughts. Great article I love to see that you are truly living your life. I was diagnosed with mild vonvillebrands at the age of 17 after spending 2 years in and out of hospital wondering what was wrong with me as my levels were constantly high & low drowning on what time of the month I had a blood test. Finally I got an answer. My Mum told me best to give up all my sports which I played basketball, tennis, badminton etc. of course I did fearing my life. How wrong I was! By the way for me there is no history of bleeding disorders in my family hence they couldn’t work out was was wrong with me. We then found out a distant cousin had haemophiliac. I then lived back in Ireland but now live in Australia… Through research I’ve found there is no need to be scared off it at all and people cope fine with it. So really appreciate your article it was awesome! Thank you so much, Lorraine! It is great to hear from other easy bleeders, especially women (who are extremely rare). Awesome comment! It is fantastic hearing from you. And, thank you so much for sharing my article! I have always been amazed at the low amount of support for people with bleeding disorders, especially in places like India. I wish there was something I could do to help spread awareness and assist you guys! I am doing everything I can here in the states, but I wish there was more. I will continue leading the fight to raise awareness and help those who need it. Thanks so much for your comment!